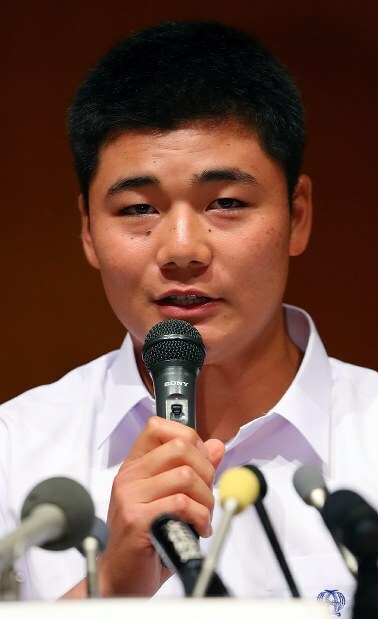 TOKYO (Kyodo) -- Kotaro Kiyomiya, who holds the unofficial high school baseball record of 111 home runs, on Friday expressed his intention to turn professional. "I have decided to try for my next big dream with the understanding of how tough it is to be a pro," the 18-year-old Waseda Jitsugyo High School senior told a press conference in Tokyo. "I want to clear each hurdle that presents itself before me. I would like to join a team that will help me grow as a player," said Kiyomiya. Kiyomiya also said he hopes that he will one day be able to hit 868 homers and match the all-time professional home run record held by Sadaharu Oh. Kiyomiya hit two home runs to help Waseda Jitsugyo reach the last four of the national high school baseball championship when he was a first year student. This year, the team lost in the second round of the spring invitational championship and also failed to qualify for the summer championship at Koshien Stadium. But Kiyomiya was named to the national team for the U-18 World Cup held earlier this month, and broke the previous high school home run record of 107 in a practice game before taking off for Canada for the 12-nation competition. Kiyomiya's father Katsuyuki, 50, is a former captain of Waseda University's rugby team and is currently manager of Top League rugby club Yamaha Jubilo.